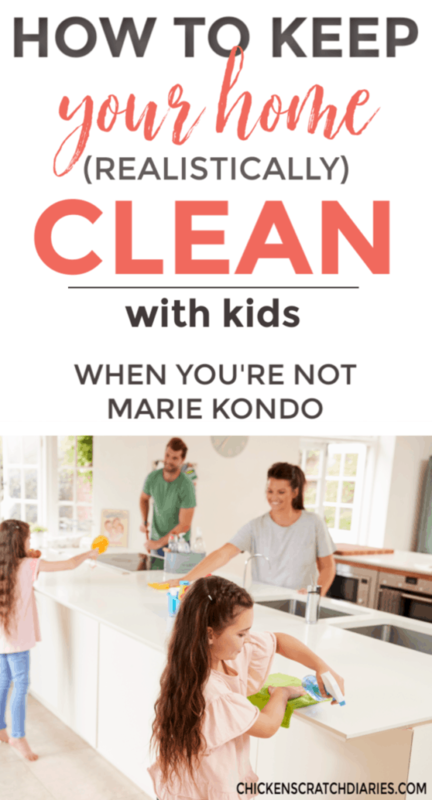 You want to figure out how to keep a clean house, but it seems impossible with kids, right? Trust me, I’ve been there. I am not going to pretend my house is a shrine to cleanliness and order. That would be a lie! But I have worked pretty hard to put systems into motion that make sense for my family and are relatively simple to maintain. While my homemaking skills are always a work in progress, just having a (flexible) plan makes my life so much easier. It’s the only way I can juggle four kids, two jobs and everything else life throws at me. Here are 6 things you need to do if you want to have a (realistically) clean house, with kids. Having a “clean” house can mean completely different things for different people. If you want magazine-ready-clean, it’s going to take a lot of time to achieve that level when you have kids underfoot. This type of cleaning is going to require late nights, early mornings and probably hired help. Dare I say…magazine-ready probably isn’t realistic if you’re a busy mom, or are on a budget. So when you have kids especially, I think it’s important to take stock of what things matter the most to you. Do neatly made beds get your motor running? Daily-vacuumed carpets make your heart sing? Add those items to your must-do list. Pick out those top cleaning tasks that are most important to you – for your health, sanity and happiness and make those your priorities. My current list of daily priorities include: loading the dishwasher (sometimes twice); washing pots and pans; wiping down counters and sweeping the kitchen floor; having all living room toys put away before bed. Add at least 2 loads of laundry per day, and that’s it! My must-do daily cleaning tasks are based around what’s most important to me. With four kids, we have to stay on top of dishes or there are no dishes to eat off the next day. By sweeping each night, I won’t be walking on crumbs the next morning (my biggest pet peeve!) and that’s less dirt/food being tracked into other rooms. And having a tidy living room before bed just calms my nerves, somehow. At my house, everything else gets done on a different schedule, or as-needed basis. Think about the areas of your house where clutter and/or dirt just build up, and come up with easy solutions that will make it a no-brainer to tackle them as you go. Cleaning as you go is really the secret to a clean house, anyhow. You can’t let stuff pile up, because then it gets overwhelming and you’ll give up. Here’s an example: I used to wait until the weekend to clean the bathrooms, which is a task I hate. When I stopped to evaluate it though, I realized I hated it due to a lack of organization. So, I decluttered my bathrooms recently and made space for cleaning supplies in each bathroom. I made up three batches of cleaning spray (I use this non-toxic concentrated cleaner), one for each bathroom. Now there are cleaning supplies readily at-hand, along with a roll of paper towels (I buy those in bulk from Sam’s Club, the Member’s Mark brand are amazing!). I no longer have an excuse not to spray down the shower or toilet whenever I have a spare moment. I had also been avoiding Clorox wipes because I don’t like the smell (I’m super sensitive to bleach and fragrance), but I missed their convenience. So I found a plant-based alternative instead. Another thing that has helped us recently is having a big trash can in the garage. When we get home from school, I can quickly go through the school papers and junk mail I’ve just gotten from the mailbox before it even gets into the house. Any bills or papers we need to save goes directly to my desk where I file them away on the weekend. Next on my list of “making a clean life easier” is to purchase a Bissell Crosswave mop that sweeps and mops at the same time. My 10-year-old Shark steam mop just bit the dust and although I loved it, I want to try something that will make the task even quicker by saving that sweeping step whenever I need to mop! Plus, I can clean my hardwoods and area rugs all at the same time. As I’m writing this, the nation is going nuts over Marie Kondo’s Tidying Up Netflix series. As for me, I’ll probably watch it at some point and maybe it will inspire me to take decluttering to a whole new level. But for now, I rarely have time to watch Netflix and have even less desire to work myself into an organizational frenzy. What I HAVE learned from living in small spaces (with kids) for several years is that you have to be the gatekeeper of what you bring into your house. This is HUGE. Just say no! Go grocery shopping alone whenever you possibly can — this will help you to concentrate and keep little hands from adding items to your cart! Don’t visit thrift stores with kids- or not often. I’ve stopped going unless I have a very specific purchase to make because in the past we were dragging home far more items than we needed. Don’t have yard sales either, if you can avoid it. Buy less with the idea that you are carefully planning purchases of quality items and will give it away when you no longer need or want it. It’s a powerful motivation! While building my online business over the last two years, I’ve saved a lot of time and money by not having time to shop. I used to love to browse online and was a weekend thrifter, but time is money. And more stuff doesn’t make me happy. I now just have a set budget for non-essentials (such as clothing) each month. I keep a list in my planner of stuff we need or want and I try to buy quality items that will last (usually new but on sale), instead of making a hobby out of finding “deals”. It’s just too easy to get sucked into buying more than you need and actually wasting money on those “deals”. The less stuff you have, the less you have to manage, organize, find space for and declutter later on. Physical clutter leads to mental clutter too! And who has any brain cells left for mental clutter? Not me. Cleaning definitely is easier when you have older kids that are able to help, and more frustrating when you have little ones who just want to constantly undo your progress! I do think it’s important to start good habits early. Even if you keep most of the toys in the younger kids’ bedrooms, they can learn to pick them up each evening as part of their daily routine, right before bedtime. Those habits set the stage for other habits you will want them to practice: putting their dishes in the sink, putting their clothes in the hamper and throwing away their trash, for example. My big kids have dedicated chores based on their age and ability. My middle child (age 10) is in charge of folding the laundry. Any laundry that’s in the dryer goes into a big bin to be folded each evening, and that’s her main chore. My oldest daughter (age 13) unloads & loads the dishes. I do help with these tasks as needed and sometimes we do them together, but they understand this is their daily responsibility. 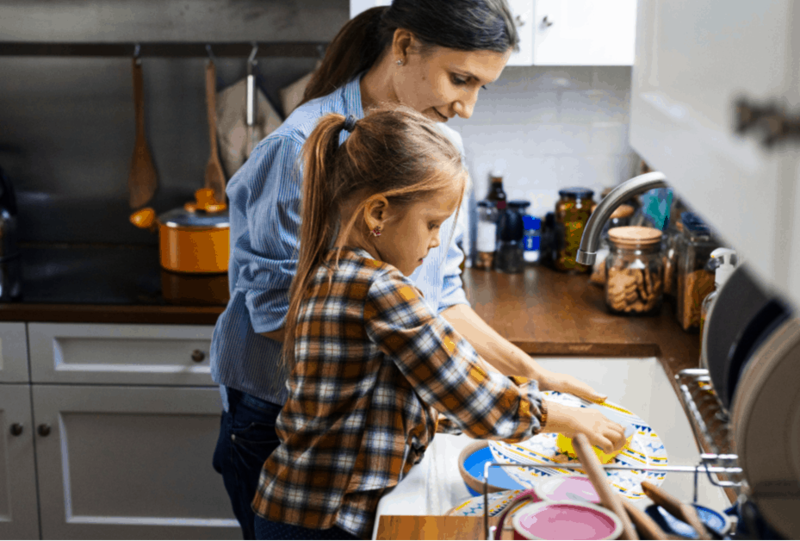 We still struggle with getting everyone on board the cleaning train, but my hope is that my kids will grow up with a sense of responsibility to contribute to the household work. And of course, I want them to learn valuable skills that will help them throughout life! We all have “war zones” in our home: those spaces that are always a mess and cause a lot of unnecessary fighting and drama. One of my zones was the bookcase area in the living room. I loved showcasing my vintage books which were handed down from my grandpa, and keeping my favorite titles nearby. However, my toddler would not leave the books alone, and the older kids weren’t great about returning them to the shelves either. In reality, I wasn’t spending as much time reading these last two years or so, and definitely not enough time to justify the mess they created. So I moved the bookshelf to a room that gets much less traffic and boxed up most of my old classics for now. They’ll be appreciated more in the future! We bought this horizontal bookshelf at Target last year and it doubles as a TV stand/entertainment Center for us. It has nice, deep shelves and I decided to keep just a handful of books and devotionals in one section, including a few of the kids’ favorites. The other “cubby” areas make great storage for Wii remotes and toddler toys, tucked into neat little bins. Beyond my small book nook, instead of adding to the book clutter, I either borrow books from the library, or buy the Kindle version. I’ve actually found that I enjoy reading on my phone in short bursts. And, I’m more likely to finish the book because it’s always with me and I don’t have to hunt it down. If you read a LOT, you should try out the free 30-day trial of the Kindle unlimited membership (choose from over 1 million books, unlimited reading). Think about the problem areas you’re constantly dealing with in your home. Brainstorm ways you can divert, downsize, discourage or otherwise eliminate clutter from making your life more hectic than it needs to be. If you have a good friend who is an organizing queen, ask her to come over and give an honest opinion on how to tackle your biggest areas of concern. You might be surprised at how another set of eyes can bring order to the chaos in no time! Your husband might even offer helpful suggestions. I used to balk at that idea, but I’ve learned that (most) men are pretty analytical and can come up with solutions for storage that make sense. We have much of the same philosophy when it comes to owning less and being realistic about what “clean” is going to look like with actual people living in your house. But Hilary goes a step further by breaking down each room of the house and giving practical solutions to the same types of struggles most moms share. You can see what the course has to offer here. Whatever your cleaning frustrations entail, it’s important to know that you’re not alone! In the thick of raising kids, having a perfectly clean house shouldn’t be your number one priority. But being able to find things you need and quickly tidy up a space can bring a sense of peace and order to your home. What I love most about having a simple cleaning routine is that it frees up more time to do the things that I love – spending time with kids, reading and blogging, for example. Just keep in mind that you don’t have to be a Marie Kondo to implement a few new habits into your everyday life. Just start small! 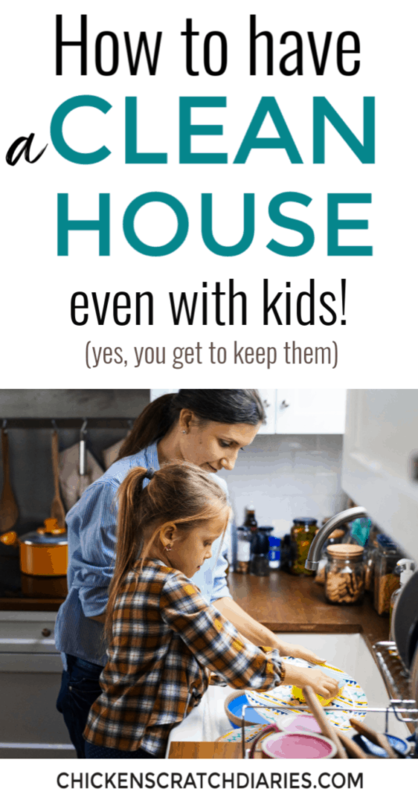 I’d love to hear YOUR best tips on how to keep a clean house with kids, in the comments! I like clean floors and clean bathrooms. I vacuum the kitchen area sometimes after every meal, and do a deep clean on my floors weekly. I clean my bathrooms once a week but also wipe the sinks down after use. Clearing out clutter makes me think twice about future purchases. I have to love the item!!! !